It’s entirely possible to walk down the same street in New York City every day without noticing certain buildings or architectural features. New Yorkers are skillfully taught to tune out their surroundings to maintain sanity. This morning I walked down 44th Street on the south side of the street as opposed to my preferred north side due to a construction project. As I continued down the block I glanced across and noticed the most extraordinary roof garden and pergola perched on top of the New York Yacht Club. 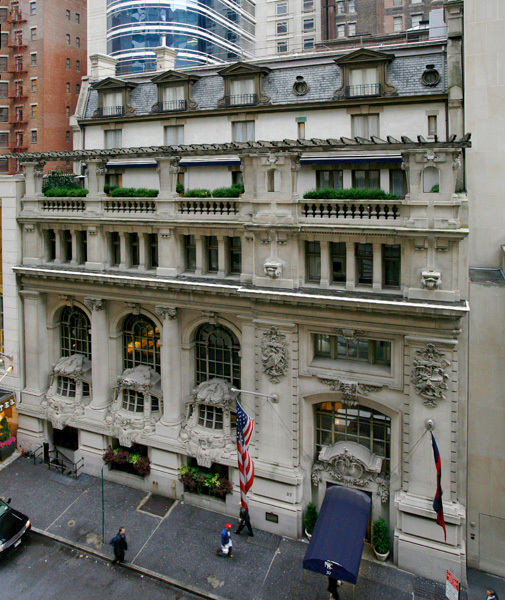 The New York Yacht Club is a beaux-arts style architectural masterpiece. The architects Whitney Warren and Charles Wetmore designed the building in 1899-1900 before their first big commission to work on NYC’s Grand Central Terminal. With plenty of work on early skyscrapers and hotels and private country homes under their belt, Warren & Wetmore developed a prestigious resume of projects. 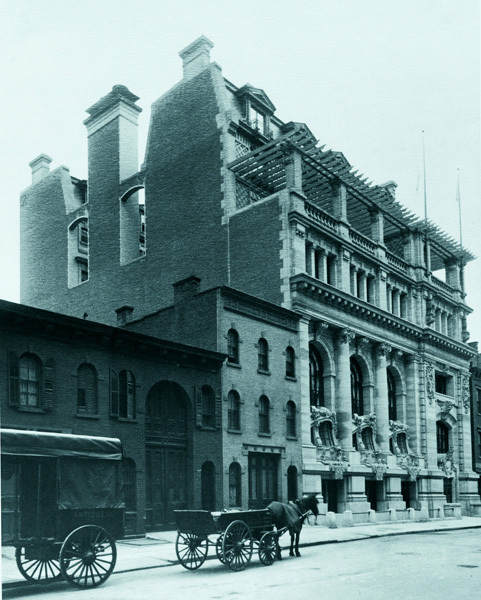 As shown in the photograph from 1901, the roof garden was part of the original concept of the building. Today the same pergola design remains with neat rows of boxwood hedges lining the edge of the terrace facing 44th Street. Part of my surprise in seeing this terrace comes from the fact that there are very few roof gardens in this part of midtown. The ornate building features galleon-style windows along the first floor which are dripping with chains, seaweed and various nautical motifs. The garden sits like a little gem set inside a piece of jewelry. See it in person: The New York Yacht Club is located at 37 West 44th Street between 6th and 5th Avenue on the north side of the street.